After several months of planning, our family has set off on a 3000 mile journey across middle America to the western states of South Dakota and Wyoming. It will be hard to top last summer’s Birdy Goes West trip, but if anything could come close, it would be a journey across the Badlands and the Blacks Hills to Yellowstone National Park and the Grand Tetons. This year is the centennial of the National Parks Service system, and I can’t think of a better way to celebrate the NPS 100 than with a trip through several parks service sites, including the first national monument and the first national park. Every road trip needs a name (or, more exactly, every road trip needs a hashtag for the Instagram photos). I decided on #BirdyNPS100 to represent our trailer, Birdy, and the NPS centennial celebration. 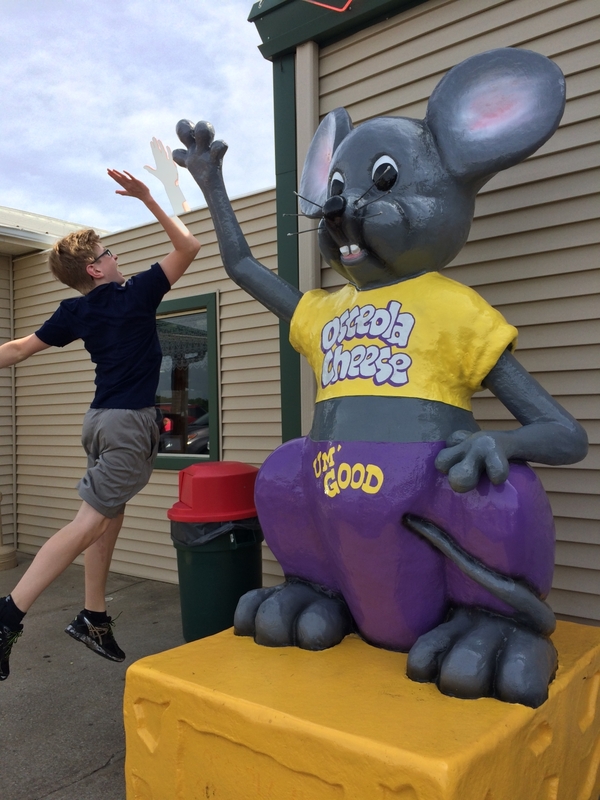 We set off with a plan to make it to Iowa with as few stops as possible; however, the Osceola Cheese Factory lured us in with the promise of free cheese samples. They make over 250 varieties of cheese. (My apologies for the blurry shot. 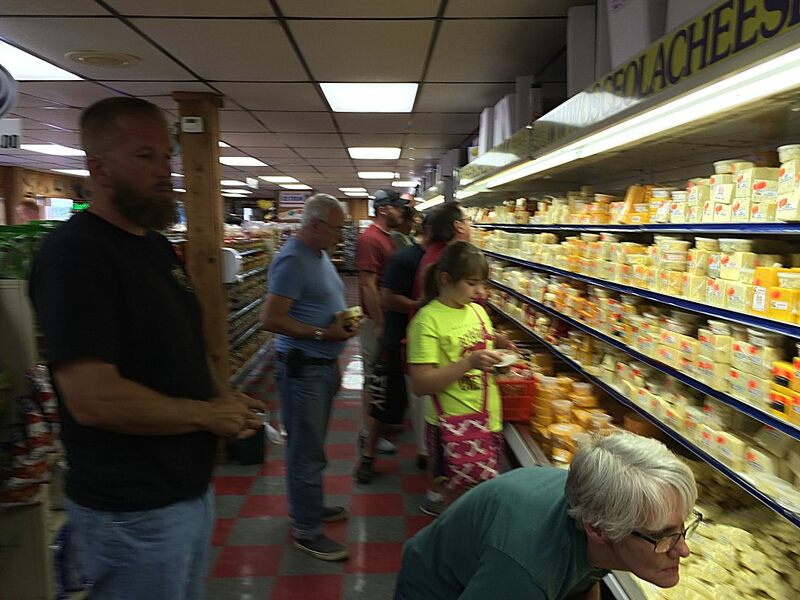 I was trying to be stealth as I photographed these people checking out the humongous wall of cheese). I enjoyed trying unusual flavors such as Blueberry White Cheddar, while my older son braved the Hotter than Hell Ghost Pepper Cheddar. He was fine at first, but it was fun to see his face change as the heat hit him. If you’re heading north of Bolivar on Highway 13 through Missouri, this is a great stop. Get a sampler bag to nibble on while you drive. Say hi to the mouse for us! We continued our trip under stormy skies. We dodged the worst of it, luckily, and only got hit with a little rain. 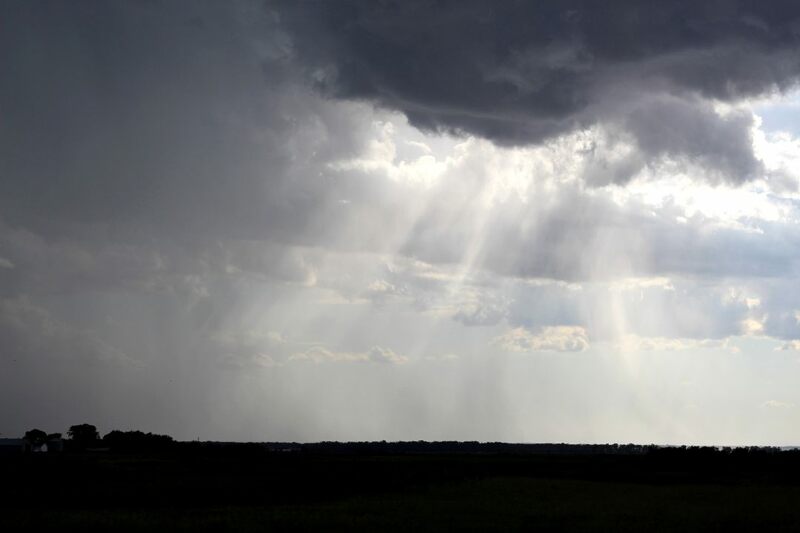 These dramatic skies made the drive through Iowa more entertaining. 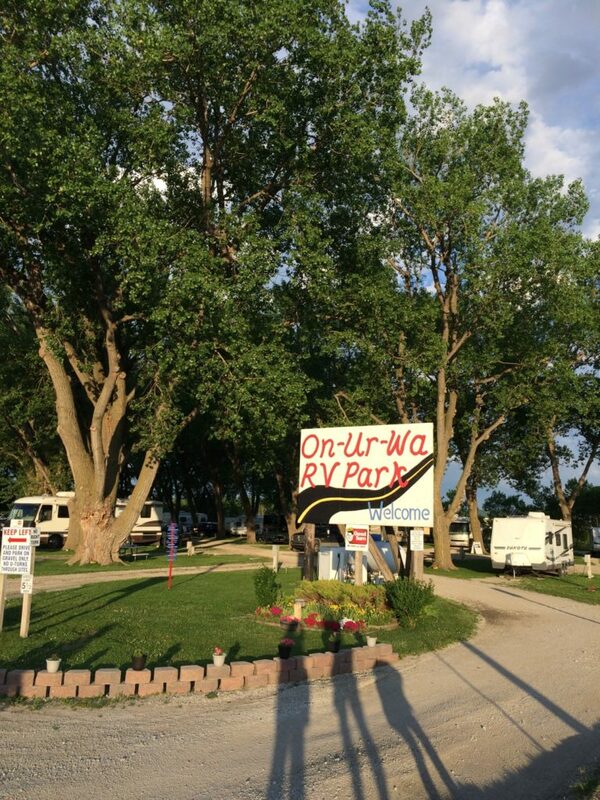 Our first stopover was in Onawa, IA, where we stayed at a nice little campground called On-Ur-Wa RV Park. Great shade, clean showers, and walking distance to a couple of restaurants. 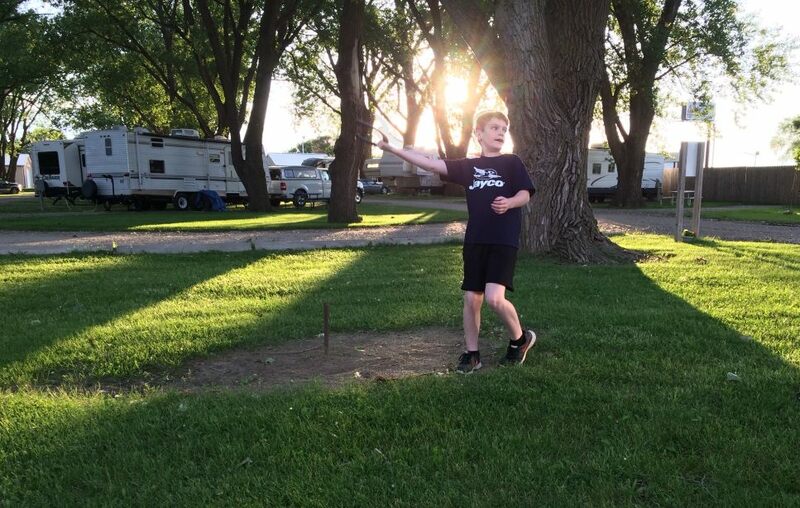 After a 7-hour drive, it was nice to relax and play some horseshoes. Just up the road from the campground is the Lewis and Clark State Park. 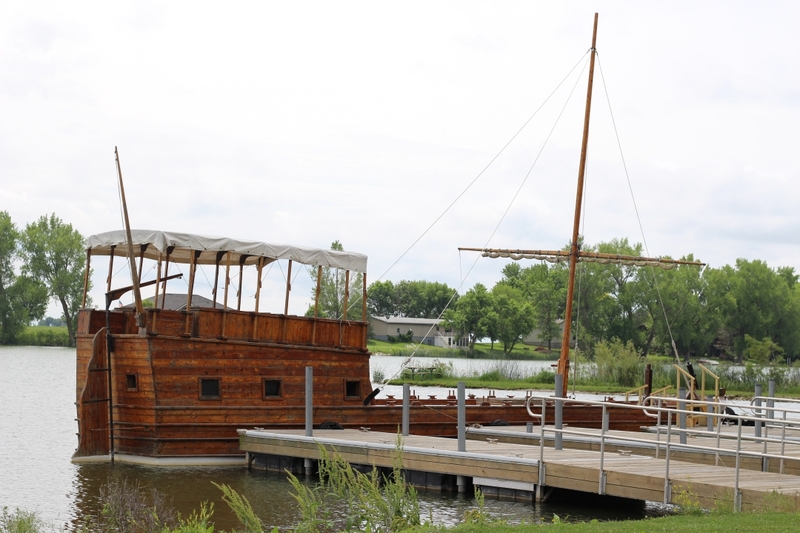 Long before we visited Onawa, IA, Lewis and Clark had a layover here on their journey westward. 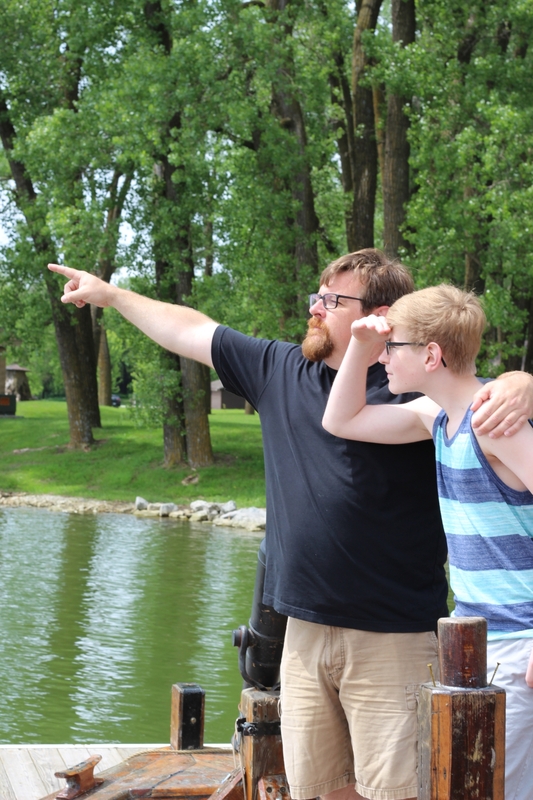 The park is situated on a small oxbow and includes a replica of the keelboat Lewis and Clark used. It was interesting to check out this boat and to imagine it being use to navigate the rivers in the early 1800s. It was much larger than I imagined. 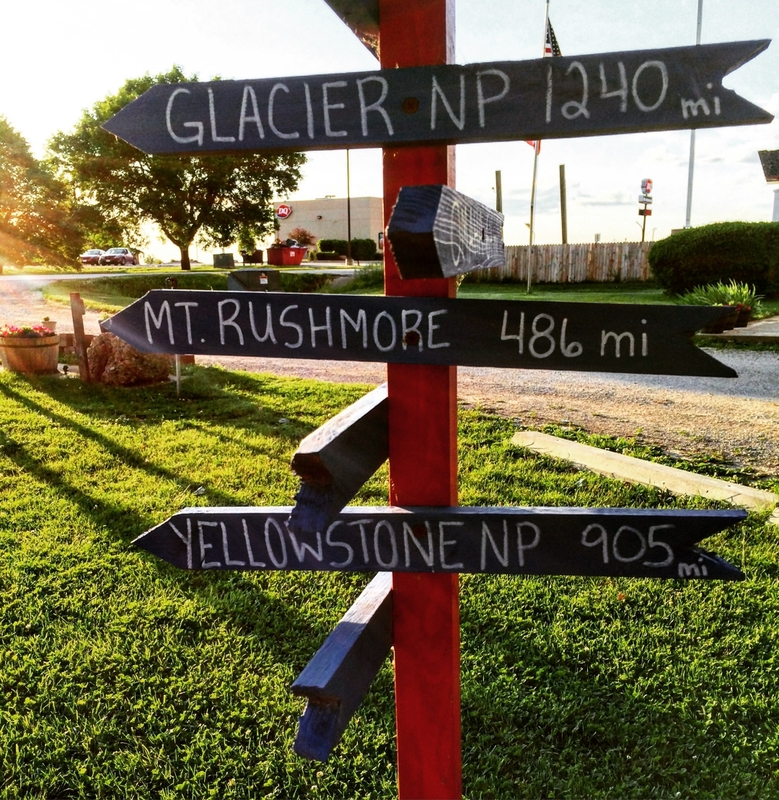 I loved this sign I found in the yard at the RV park as it pointed us on our way. After a quick stopover, we were ready to hit the road and see some new landscapes. Keep up to date on where we are by following us on Instagram, Twitter, and Facebook. Just look for Travels with Birdy. 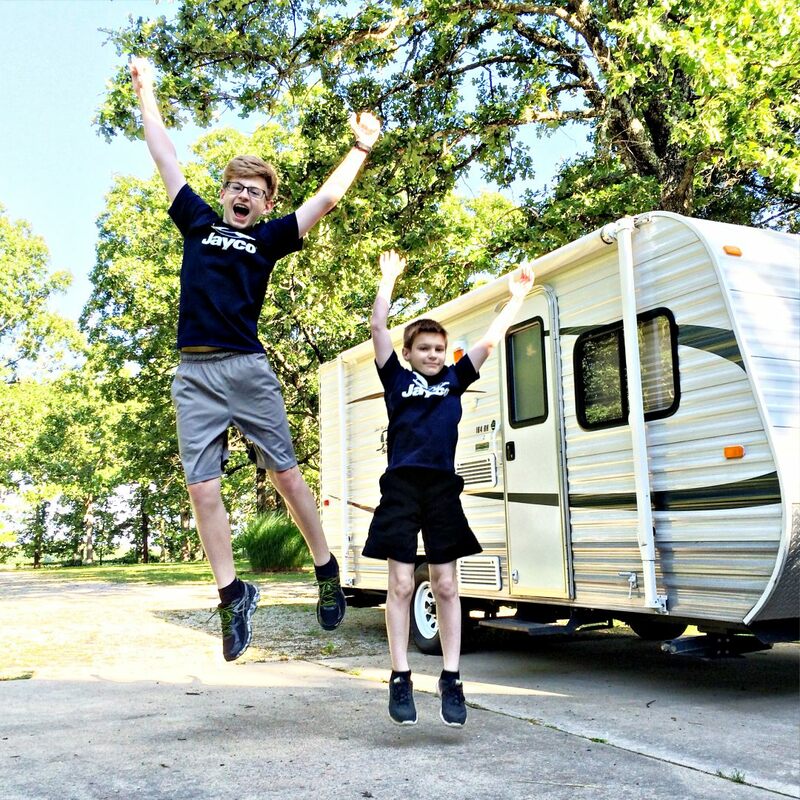 I hope to update the blog along the way, but it’ll be behind the times since we will be out adventuring or driving. Posted in: Places We've Explored. Tags: BirdyNPS100, Iowa, Missouri. Always enjoy reading your blog!!! BTW, Osceola Cheese has always been a favorite of ours and we stopped there every time we went to KC or my Dad’s hometown in KS and also when we went to Liberty, MO to visit Paige at William Jewell. Keep having fun!!! Hi Lisa. Thanks for reading! It was our first visit to Osceola Cheese, despite passing it for years! Now we know! Loving following along on Instagram so far! And I’m so impressed that you’ve gotten a blog post up already; I keep thinking I need to get started on that for our trip, diligently editing a few pictures…then going to bed. Thanks, Gretchen! It is always a dilemma because I want to share the excitement at the time, but yes, there’s no way to look at all the photos and do the writing while traveling. I need to try to take fewer than 1364 photos at each stop, so that process won’t be as difficult. 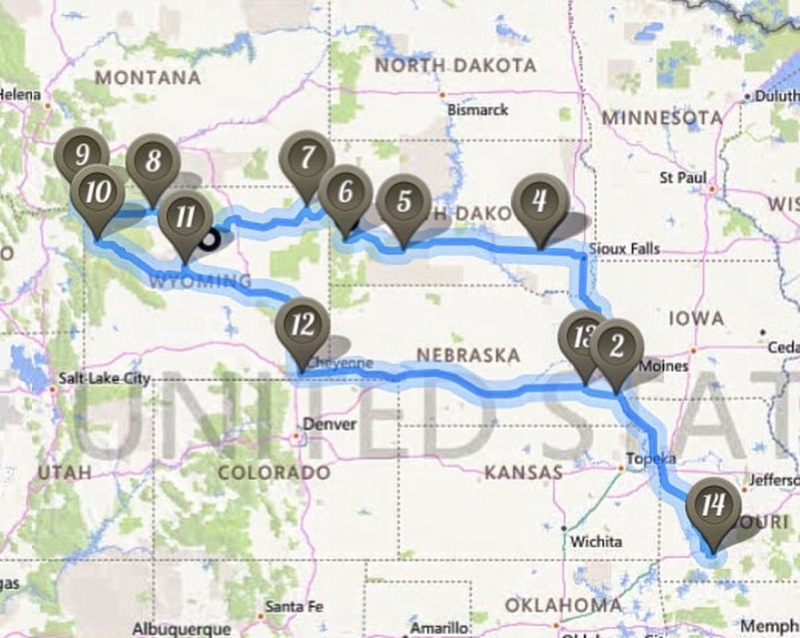 🙂 I think I finished writing about our last road trip 6 months after it was over, but hey, that provided plenty of steady blog content. I also really ended up enjoying reliving the vacation as I wrote about it so many months later.